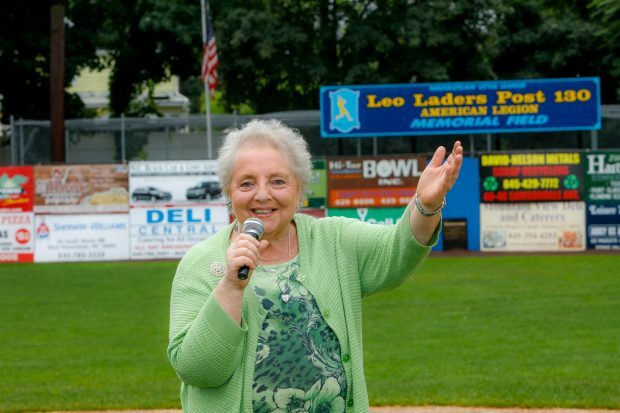 Maureen Corallo, a grandma and singer from Rockland County, beat breast cancer and is singing the praises of Good Samaritan Hospital. I’m known as the lady who sings The Star Spangled Banner. It’s a hard song to sing, and if you start in the wrong key, it’s over,” says Maureen Corallo, 74, a grandmother of five who lives in Thiells, in the Town of Haverstraw. Hitting the right notes in our national anthem at Little League openers, naturalization ceremonies to welcome new citizens and community events isn’t the biggest challenge in Corallo’s life though: Two years ago — just six months after her youngest son, Steve, died from glioblastoma — she was diagnosed with Her2+ breast cancer, which is often associated with a higher risk of recurrence. Corallo first received radiation treatments for breast cancer 22 years ago at Good Samaritan Hospital, a member of the Westchester Medical Center Health Network (WMCHealth), and she returned there to undergo treatment once again. “Everyone — my doctors, the nurses and the whole team — treated me like royalty, and I felt totally confident,” she says. In early 2016, Karen Karsif, MD, Medical Director of The Center for Breast Health at Good Samaritan Hospital, performed Corallo’s double mastectomy, and Sushil Bhardwaj, MD, Director of Good Samaritan Hospital’s Bobbi Lewis Cancer Program, administered her chemotherapy and Herceptin treatments, which she is continuing. “The two treatments are synergistic, and Maureen’s adjuvant regimen is a classic example of the state-of-the-art treatment available here,” explains Dr. Bhardwaj. “Dr. Bhardwaj would evaluate me before each treatment,” says Corallo, adding that he assessed her overall health and once sent her to an ophthalmologist and, another time, to a urologist. Corallo and her husband, Sal, moved to Rockland County in 1969. They raised three children and welcomed five grandchildren into their close family circle. She sang in their church choir for more than 42 years. She joined the PTA and wrote a regular column for the local paper, Haverstraw Happenings. Before retirement, she was a judge’s secretary at the Rockland County Courthouse. There’s been a revolution in how breast cancer can now be diagnosed and that is 3D mammography or digital breast tomosynthesis (DBT). “Research and clinical trials have proven DBT is able to diagnose up to 30 percent more breast cancers than conventional digital mammography. With this new innovation we are able to view the breast by one-millimeter slices,” says Dr. Reichard. Currently, only about 30 percent of U.S. facilities use 3D because the units are expensive, and their use requires additional training for technicians. Good Samaritan Hospital acquired a 3D mammogram in July 2016. It is also available at two other Westchester Medical Center Health Network hospitals: Westchester Medical Center and MidHudson Regional Hospital. “It’s a huge addition to our center and fulfills our desire to provide the most up-to-date imaging technology available,” says Dr. Reichard. Is Cancer Risk Mostly Hereditary or Environmental?